It was still summer when giant bags of Halloween candy started appearing on store shelves. Then, the bakeries and cafes upped the ante, pushing the fluorescent-orange-frosted cupcakes and cookies. You’re conflicted: the adult in you hates Halloween hype, but the 10-year-old still salivates at the sight of all that sweet stuff. The good news is that you and your kids can enjoy plenty of Halloween goodies without going into sugar shock. Here are some ideas for Halloween treats with a healthy twist. The Kitchn has a delightful and colorful Vegetable Skeleton that takes veggies and dip to a new level! 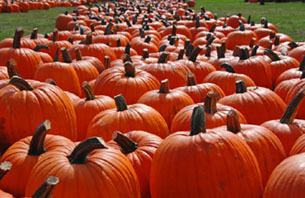 SOS (Save Our Seeds): If you are planning on carving a pumpkin, hang on to the seeds and roast them for a savory snack. Make Jell-O even spookier: If you whip up a package of orange Jell-O following the package directions and set some plastic spiders or other creepy crawlies on top, you’ve got a simple, non-fat Halloween dessert. If you are feeling more adventurous, try some Spooky Jell-o Jigglers! Calling all cookie monsters: Instead of going for store-bought, try the Skinny Chef’s pumpkin-shaped peanut butter cookies. Hot spider! Ooops, that’s cider: Hot apple cider, which consists of apple juice, a few spices and orange peel, takes just a few minutes to make. For the “over 21″ crowd try one of these Creepy Halloween Cocktails. Spiced up popcorn: Rather than making the traditional popcorn balls, why not try some of Macheesmo’s Five Spice Popcorn for a real flavor explosion! Simply Recipe’s Perfect Popcorn Recipe will guarantee no seeds on the bottom of the bowl. Pumpkins, pumpkins and MORE pumpkins: Carving a pumpkin is great fun but when it comes to cooking with pumpkins, it is a lot easier to just buy a can of pumpkin puree. Startcooking’s Pumpkin Soup Without the Fuss is a snap to make using pumpkin puree. Or you might want to try Pumpkin Pie for Beginners which comes out perfect every time!